Is This The Most Irresponsible Instagram Post Ever? There’s some silly s**t online but Blac Chyna’s sunbathing picture takes some beating. To be fair, we don’t know an awful lot about Blac Chyna – supposedly she’s a ‘celebrity’ but the only time we’ve seen her mentioned (during our lunchtime tabloid reading) is as Kylie Jenner’s ‘Love Rival’ or Kim Kardashian’s ‘Ex Best Friend’. So, until today we didn’t know who Blac Chyna was let alone have an opinion on her. Well, that changed the moment we came across what we reckon is probably right up there in terms of the most stupid things to appear on Instagram – which is really saying something because there is some weird stuff on there. Not cool Blac! Not cool! For one; she’s used ‘milfin’. Please, just don’t. And two; promoting sunbathing with oil is beyond irresponsible. Cancer Research UK report that more than 13,000 people develop malignant melanoma each year and in the US, The Skin Cancer Foundation has found that nearly 5-million people are treated for skin cancer every year. The only sensible thing to do if you choose to sunbathe is wear a high SPF. Chucking on what is essentially cooking oil is a sure-fire route to, not only skin cancer, but also accelerated skin ageing and pigmentation. 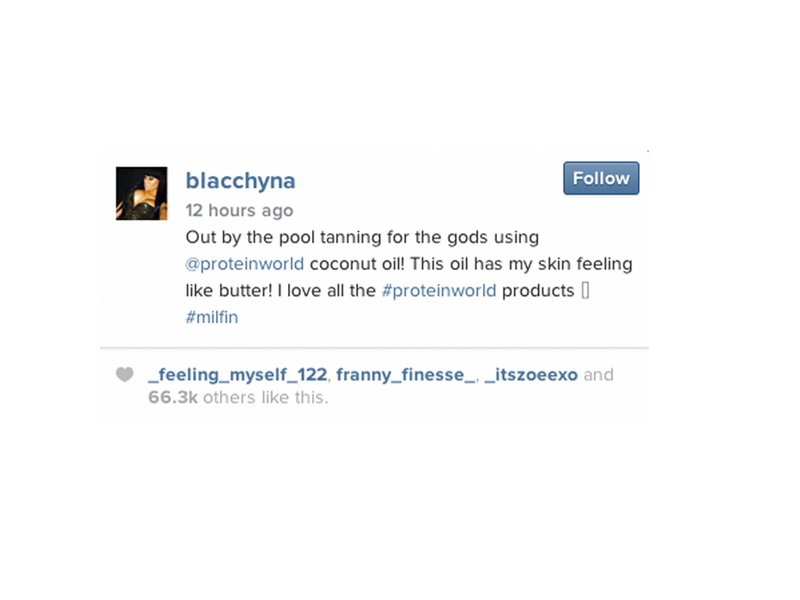 So, Blac Chyna; promoting cooking your skin in oil – coconut or not – seems like a pretty silly thing to do if you ask us. The moral of the story here is ‘think before you post’. Slap on the factor 30 and don’t try this at home kids.